WASHINGTON - Three Republican Senate leaders have reintroduced a measure to permanently repeal the estate tax - an action long desired by tire dealers and other small business owners. 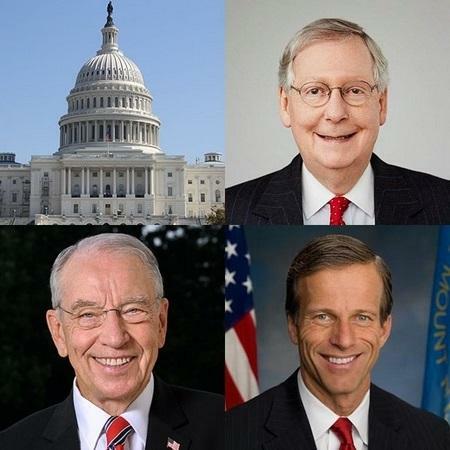 The Death Tax Repeal Act of 2019 was introduced Jan. 28 by Senate Majority Leader Mitch McConnell, R-Ky.; Senate Majority Whip John Thune, R-S.D. ; and Senate Finance Committee Chairman Chuck Grassley, R-Iowa. Twenty-six other Republican senators joined them as co-sponsors. "It's the government's final insult to force grieving families to visit both the undertaker and the IRS on the same day," Mr. McConnell said in a press release announcing the bill's introduction. Under tax cut legislation in 2017, the individual estate and gift tax threshold was raised to $10 million through 2025. However, small business owners complain that the estate tax threatens the plans of small business owners to pass their businesses onto their heirs. "Although we made great progress during the Tax Cuts and Jobs Act negotiations, the death tax still remains an onerous and unfair tax that punishes hardworking families," Mr. Thune said. Political opinion has long been sharply divided on whether the estate tax is fair. "Spend your money on riotous living - no tax; leave your money to your children - the tax collector gets paid first," according to a letter by economist and Nobel laureate Milton Friedman in a letter posted on the website of the Family Business Coalition, an anti-estate tax group. "That is the message sent by the estate tax," according to the letter by Mr. Friedman, which was co-signed by 700 mostly conservative and libertarian economists. "It is a bad message and the estate tax is a bad tax." On the other hand, the non-partisan Center on Budget and Policy Priorities argued that the estate tax is the most progressive part of the U.S. Tax Code, because it affects only those who are most able to pay. "The money the estate tax raises helps to fund essential programs, from health care to education to national defense," the CBPP said on its website. "If the tax were further weakened or repealed, other taxpayers would have to foot the bill for these programs." The Tire Industry Association (TIA), a member of the Family Business Coalition, has long sought estate tax repeal. "We're glad they're doing that in the Senate," TIA Executive Vice President Roy Littlefield III said regarding the new estate tax bill. Mr. Littlefield said TIA would work hard to obtain more co-sponsors and advance the bill toward a vote. "For a typical tire dealer, this is one of the major bills," he said. However, Democratic support for estate tax repeal is virtually nil, and Mr. Littlefield said he couldn't imagine the House of Representatives would approve the bill, except as part of a larger deal. "We will keep working for that," he said. Pictured are (clockwise from top, right) Republican Sens. Mitch McConnell, John Thune and Chuck Grassley. On January 25, 2019, OSHA published a final rule revising the requirements for its 2016 "Improve Tracking of Workplace Injuries and Illnesses" regulation. To protect worker privacy, the Occupational Safety and Health Administration (OSHA) is amending the recordkeeping regulation by rescinding the requirement for establishments with 250 or more employees to electronically submit information from OSHA Forms 300 and 301. These establishments will continue to be required to maintain those records on-site, and OSHA will continue to obtain them as needed through inspections and enforcement actions. In addition to reporting required after severe injuries, establishments will continue to submit information from their Form 300A. Such submissions provide OSHA with ample data that it will continue seeking to fully utilize. In addition, OSHA is amending the recordkeeping regulation to require covered employers to submit their Employer Identification Number (EIN) electronically along with their injury and illness data submission, which will facilitate use of the data and may help reduce duplicative employer reporting. Nothing in the final rule revokes an employer's duty to maintain OSHA Forms 300 and 301 for OSHA inspection. These actions together will allow OSHA to improve enforcement targeting and compliance assistance, decrease burden on employers, and protect worker privacy and safety. This final rule becomes effective on February 25, 2019. See the full notice here.